Well, today I was going to write about the Ideal Woman, but I have something I just have to share. Today, I went to see a chiropracter. He is my new favorite person in the world. Since I was 3, I have also had serious knee pain. Doctors could never figure out what was wrong so I just lived with it. To this day, I live with it. When I am on my feet for long periods of time, my knees will ache, severe sharp pains, that shoot down to my ankles. It pretty much incapacitates me. I have to curl up with a heaty pad on my knees and wait for ibprofen to take away the pain. I get knee pains quite often, cuz it is rare for me to be off my feet very long. Just something I figured I would unfortunately deal with for the rest of my life. When I got into college, especially nursing school, the back pain intensified. Most likely a result of the insane stress, lack of sleep, and hours spent bent over a book studying. Or so I thought. In the past 2 months, that back pain has hit me with a vengeance. Oh man, its terrible. My massage therapist, Dr. Hubby, has rubbed my back several times, and it won’t loosen up the muscles at all. My back is tight. My neck hurts. In between my shoulders, my middle back and my lower back have been in a constant, throbbing pain. I can not get comfortable when sitting, standing, holding Eli. It is just constant. I am loosing sleep at night as I toss and turn trying to get comfortable. It is always on my mind because it always hurts. So I finally went to see Dr Pochucha. And here are my results. Bad news #1- Yes, I took pictures of my xrays! 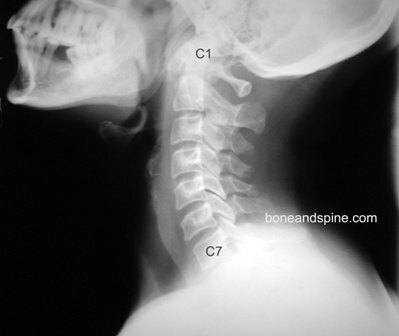 The picture on the left is a profile of my neck, of the cervical vertebrae. (Don’t worry, I don’t have craziness in my head. Those are earrings.) The picture to the right is what the cervical vertebrae should look like, with a curve that resembles a C. As you can see on my picture, it is going the complete opposite way. No wonder I have so much neck pain! Congratulations to me. I have degenerative disc disease. This is what happens to the little old ladies you see that are hunchbacked. Great. I’m on my way to being a little hunchbacked old lady. I so don’t want that!!! Luckily, he thinks we can fix this. He said it normally takes about 20 years for this happen so it will take awhile to fix this (hopefully only like 3 months), but he does believe he can fix this and that will help take all the pain away I feel in my shoulders and it will most likely help me with my allergies as well. Bad news #2- I have to much curvature and space in my lower back. 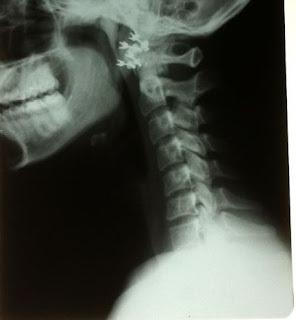 This is causing the nerves in my middle back to be pinched. That explains the headaches, the stomach aches. And get this…the knee aches. Since I was 3, no one has been able to give me a reason for the knee pains. I’m really anxious to see if fixing my spine will rid me of that knee pain I have dealt with all my life. This also explains the gassy bloated feeling I always feel too. This even explains why I had such severe pain in my hips during my pregnancy (I could barely go grocery shopping I would hurt so bad!). This explains so much! 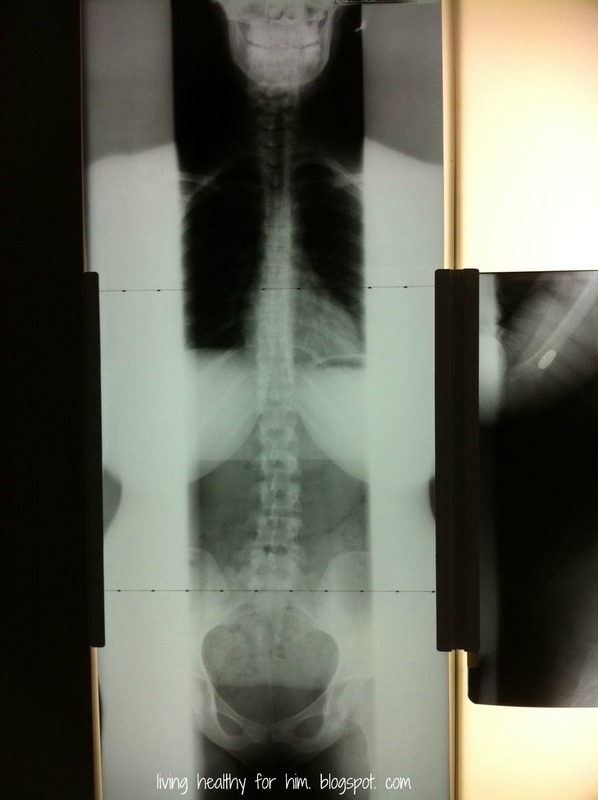 Bad News #3- When he first looked at this picture, he asked me “Have you ever been diagnosed with scoliosis?” No. 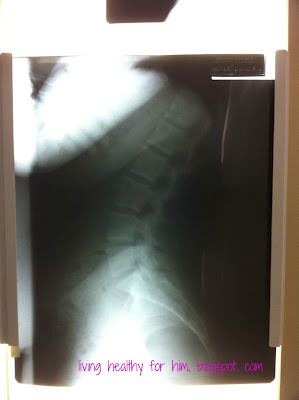 “Well, you certainly have some going on here.” As you can see, my spine doesn’t exactly resemble a straight spine. It is all sorts of wonky. So you can see why my back has been hurting. I am so messed up! Now get this. This was the most exciting news Dr. Pochucha gave me! My hips are not lined up at all. My pelvic bone is titled and my lumbar vertebrae are squishing nerves affecting several different organs in my body. That certainly doesn’t sound like exciting news. But it is. I finally have answers to why I had a c-section. He asked if I had irregular and heavy periods. YES. And then I told him about my delivery. He asked if I had an epidural. YES, I HAD 3 FAILED EPIDURALS. Turns out that my lumbar vertebrate were/are smooshing my nerve that relays messages to the uterus which explains my crazy irregular, heavy, painful periods and explains my difficult delivery. This explains why my contractions were never strong enough to progress my delivery past a 4. And once I had an epidural, that just shut the whole works down. Once I had the epidural, there was absolutely no way that I would deliver vaginally. The impulse was already being weakened by the smooshing of the nerve prior to the epidural and the epidural just turned off any chance of the nerves telling the uterus to contract. It didn’t matter how much pitocin they gave me and they gave me ALOT of pitocin! I was doomed from the moment they gave me the epidural. I am completely convinced now that chiropractics should be a part of maternity care. And I will be getting chiropractic care with my next pregnancy. How many “failures to progress” occur because of situations similar to mine? And I hate that word “failure” to progress. It is a terrible phrase to tell a mother that tried so hard to delivery vaginally. Ooo man, I feel a blogpost about that coming on in the future! And this is by far the best news I have heard in a long time regarding my body! If we fix all this, my chances of having a successful VBAC will skyrocket. but you have no idea how excited I am to hear this. I not only have answers as to why my delivery went the way it did, but I also have hope in future deliveries. After going over the results, we did the first set of adjustments. Oh. My. Gosh. He popped nearly every bone in my spine. And it was amazing. Simply. Amazing. It felt so good. I haven’t been able to pop my own back for years now and with the amt of “poppage”, I exclaimed “that was like 10 years of popping that have been stored in there!” He laughed and proceeded to break my neck. It is still there, and he said it will take time, but the massive intensity level of that the sharp aching pain has DRAMATICALLY decreased. I mean…WOW. I am sitting here on the rocker in E’s room as he plays, rejoicing in the fact that I have not had to change positions 700 times to find relief. WOW! I go back on Monday for another adjustment, and I honestly cannot wait. Perhaps I will even get a full night’s sleep tonight! Do you or have you seen a chiropracter? What are your thoughts on chiropractics? BIGGEST NSV OF MY JOURNEY YET! I hadn't ever seen a Chiropractor, but I had a little trouble with my back a few years ago and Josh talked into seeing his Chiropractor, Dr. Walsh. I have never felt anything like what Dr. Walsh did for me, but it was amazing. After Josh and I got in the accident in '07 I had to go back to Dr. Walsh (I tried to fight the dashboard in Josh's Jeep with my face and it won) He did everything he could for me, but I still have issues when my neck gets too cold. It will cause headaches to the point that I can't move because I'm in so much pain. I love Dr. Walsh and still talk to him, even if I'm not going in for a visit. He's just a great guy! I'm so happy that you are getting everything figured out for your body and for your health! I just have one question, though…what's a VBAC? Oh Kira! Thank you for reading my blog!! It means so much to me knowing my friends are reading what I write 🙂 You are so right, it is INCREDIBLE what the chiro's can do! I hate that the dashboard won, but I am so glad you are ok! Do you go back ever just for “maintanece” for your neck? I wonder if that would help to just be adjusted periodically. A VBAC stands for Vaginal birth after Cesearan. It's riskier for a woman who has had a c-section to have a vaginal birth, and alot of doctors won't allow a woman who has had a previous c-section to have a vaginal delivery. But there are risks either way you deliver. An it is extremely important to me to have a normal delivery. When I had the c-section, it led me into a major depression and some terrible negative body image. I mourned not getting to have that experience. But I'm getting better and healing emotionally too! I will of course do whatever is best for baby and me when delivery time comes, but I really want to be able to have a vbac if I can!